Your dog, regardless of his size or coat color, is hard-wired to act like . . . well, like a dog. He isn’t a kitten, bunny, guinea pig, or child. His behavior is unique and predictable: He’ll walk on four legs, sleep at night, and seek affection. These universal behaviors can give you a leg up in communicating with and training him. 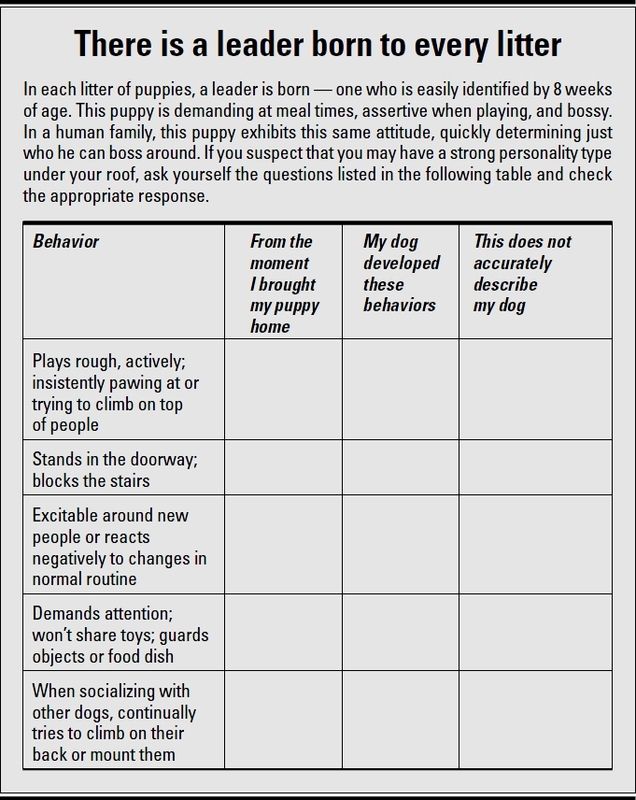 Our goal in this chapter is to help you recognize your dog’s behavior patterns, understand his communication style, and adjust your approach to teaching him how to behave. Here, you discover how to talk “dog” and look at your current situation from his point of view. This chapter also helps you get a handle on everyday life immediately, from civilizing your dog’s manners to de-escalating mismanaged behaviors, such as hyperactivity, assertiveness, fear, and impulsivity. Dogs and people have many things in common. Both species define their positions based on social interactions, each likes to learn and know things, and both need to identify their surroundings in order to feel safe and in control. Your dog also strives to mirror you; if you’re going out for a walk, he wants to go. If food is being prepared, your dog wants a piece of that action as well. When someone visits, your dog needs a formal introduction. If your dog doesn’t handle these situations well at this point, don’t despair. Although many similarities exist between dogs and people, differences occur, too — chiefly that children mature into adulthood, while dogs stay very puppy-like and devoted throughout their lives. Though a puppy matures during his first two years, he won’t voluntarily leave the home or charge your credit card. A more realistic example is that most dogs never learn to share objects unless they’re taught to do so, and many, in fact, guard possessions from even the most beloved family member (see Understanding and Resolving Aggressive Behavior). Though it’s tempting for you to be angry at your dog for this and other “disobedient” behaviors, once you understand how he thinks, you’ll have an enlightened view and be more open to performing the exercises necessary to remedy all of your frustrations. We’d love to have a nickel for every time we’ve heard the exclamation, “But he knows he’s wrong!” Dogs simply can’t perceive interaction in the way another human would. When a dog looks fearful, it’s because he is, in fact, afraid. We want to offer you a better, more cheerful approach to both training your dog and problem solving, one that leaves you and your dog feeling exhilarated and connected, not drained. Your dog needs a lot of organized structure and positive reinforcement in the form of rewards and incentives, which we discuss in this chapter and throughout the book. If the most common thing that you’re saying to your dog is “No,” your dog can’t possibly understand what he can do to make you happy. In Understanding and Resolving Aggressive Behavior, we talk about the Family Cooperation System, also known as nothing in life is free. Each time you offer your dog praise, toys, or attention, simply ask him to sit. In essence, you’re teaching him to say please. If you’re feeling a little guilty that you haven’t been offering a lot of positive reinforcement these days, there’s no better time than the present to change! Praise your dog every chance you get! “Good catch” (don’t worry if he doesn’t fetch quite yet), “Good boy” (when he’s chewing his toy), “Nice dog” (when he’s relaxing). Your positive outlook will motivate his cooperation. Make an Encouragement Chart, shown in Table 4-1, and share it with family and friends. Teach your dog what he can do to please you, no matter how insignificant it may seem. Though it’s hard to always act positively when you’re at your wit’s end, please fake it for awhile. Your dog would rather have positive attention for behaving well than negative attention for behaving poorly. If you don’t highlight his strengths, however, he’ll default to being naughty, because any attention is better than none at all. Only recently have people had the expectation that dogs adjust to long periods of alone time. For most of the 20th century, no leash laws existed — hard to imagine, but true. Dogs were left out on the back porch during the day and often left to run free at night. Long ago, most dogs weren’t even considered pets. They were domesticated and bred to aid man in tasks that clearly advanced society, from herding sheep, to guarding property and towns, to hauling supplies in wagons or sleds. The evolution of dogs as “pets” has come with the expectation that they put their working genes to rest (which isn’t entirely possible), as well as a growing awareness of their psychological and emotional needs. For more information on breedspecific information, see Interpreting Your Dog’s Breed-Specific Traits. In short, no dog — not yours, not anyone’s — enjoys solitude. As a species, dogs glean their identity through interaction. Call them “groupies,” or put it in more scientific terms, but either way, limit the amount of time your dog must spend alone. Some breeds are more sedentary than others, while certain breeds are bred to work independently. If your schedule demands time away, see Interpreting Your Dog’s Breed-Specific Traits to find out which breeds will be more apt to flow with periods of solitude and what you can do to ease their isolation. Imagine your dog’s level of energy on a scale from 1–10, where 1 equals sleep and 10 is an excessively hyper, fearful, or aggressive response. Now, further split the scale into two zones: the contained happy zone (1–7) and the detached, chaotic zone (8–10). Your goal in understanding and training your dog is to help him learn to function with enough presence of mind to live with you predictably and comfortably — in other words, to operate in the 1–7 zone. Do you suspect that your dog is operating in the 8–10 zone all too often — for example, when the doorbell rings, the kids come home, or just when you’re sitting down to relax in front of the television? Of course, you’d like your dog to simply reflect your energy level: that he rest when you’re relaxed, accompany you when you go outside to walk or play with him, and otherwise entertain himself when you’re occupied. Though this level of attention is asking a lot of an untrained dog, once educated, a dog naturally mirrors your timetable. In Addressing and Solving Problem Behavior, we discuss specific responses to discourage problem behavior, but for now, suffice it to say, whatever behaviors you pay attention to will tend to be repeated. If your dog responds to a direction or chews a toy and you praise him for that, he’ll remember. If your dog’s acting wild or repeating mischief and your frustration leaks out, he’ll respond to negative attention just as easily and repeat the very behaviors that are driving you crazy. Your dog looks to you and your family in much the same way he would seek inclusion in a group of dogs. This truth places dogs, on a whole, above other species in their loyalty and focus for our direction. Defining his life’s orientation to your group activity, he focuses on his position within your family, and yet reflects his position in hierarchical terms, not as a democracy. This defining difference between our two species must be fully embraced. Democracy is an ineffective model when civilizing a dog. Choose your role now! Either be the leader of the group and give your dog direction, or he will — out of his desire to keep the family or pack system working — take over the leadership role and train you. In a group, someone must take charge and make the important decisions. A hierarchal analogy, in human terms, is team play. At the top is a single captain or co-captains, and then below them is a hierarchy of players, which is based on their seniority, strength, and potential. The captain’s role is to organize the space and activity of each player to highlight his talents. In turn, the players strive to get along and work together towards a collective goal. Most people wouldn’t ignore a toddler who looked at them with a confused expression, but those same people may overlook a similar expression coming from their dog. Because dogs are genetically programmed, especially when young, to look for direction, the opportunity to capitalize on their devotion is in the human’s hands. When ignored, a dog often repeats whatever behavior got him attention previously, creating a hard-to-break cycle. If your dog hasn’t learned these directions, look carefully at the upcoming “Giving direction” section and then direct him to the object or into position. Praise his cooperation, even as you’re helping him respond appropriately. When your dog stares at you, he is often looking for guidance. Constant adoration makes your dog restless. Acting out soon follows, often in the form of house-soiling, destructive chewing, or stealing objects. A better approach is to teach your dog the instructions in the upcoming “giving direction” section, so that you can give him guidance when he looks for it. If your puppy has been assertive from the get-go, he’s likely to have a more dominate, leadership-oriented personality. This puppy needs a consistent take-charge approach. If you feel that you’re losing the training battle, practice the exercises in Happy Training, Happy Tails, getting a professional to help you, if required. If your dog developed these traits during his adolescence or later, he has taken the leadership role only because you did not. So you need to change your behaviors to regain your status, and although you need to be consistent, this dog will be grateful that you’re taking over this demanding job. Being a leader is hard work! If you suspect that your dog is organizing your routines, you’ll need to reorganize the hierarchy. Unless you want to be dog trained, the first step in the process is deciding that you want to do it and reassuring yourself that you can do it. Attitude is everything. If you feel yourself floundering, see whether you can find the answer to your issues by checking for help in this book’s index or calling in a professional to help. Your dog is pre-programmed to accept direction, so in many ways you’re already ahead of the game. Teach your dog “Excuse me.” Your dog identifies your relationship based on spatial deference: Either you move out of his way, or he moves out of yours. Teach him to respect your space immediately! If he’s in your way, say “Excuse me” and nudge him gently with your foot until he moves. If he cuts in front of you, walk straight into him until he shifts out of your way. Is he leaning against you excessively or inappropriately? Say “Excuse me” and use your leg to push him off until he respects your personal space. Condition your dog to lie on the sidelines. Have you got a dog who always positions himself underfoot? Aside from being dangerous, his intrusion is a cry for attention. Provide him with a proper area in each room of your house and identify it with bedding and toys. If he’s reluctant to stay there, check out the upcoming “Assign play stations in each room” section. The two preceding exercises are important lessons in civility, and even more essential if you’re living with a problem dog (see Part IV). If you ask your dog to move and he growls at you, stop. This is a sign that it’s time to refer to Understanding and Resolving Aggressive Behavior on aggressive problems to see what you can do or to go to the phone immediately and call for professional help. Actively aggressive behaviors require expertise that may go beyond the scope of this book. We hear it all the time . . . .
probably gotten yourself caught in a vicious cycle. You may not realize that, ironically, it’s the prolonged periods of isolation that result in your dog’s impulsivity and mischief. Here’s one solution: Use your leash indoors. Find an appropriate training collar (see Helping Your Dog Learn from Everyday Living) and use a collar and leash ensemble to lead him through your home. Use the directions in this chapter to teach him his manners and socialize him to each room. The leash is not a cruel devise; think of it as synonymous with holding a child’s hand. What’s cruel and confusing is forced isolation. Once your dog is cooperating, let him drag the leash behind him so that you can easily grab it if needed for additional control. When you’re sure his manners have improved and he’s acting civilly, you can dispense with the leash — but not before you’re certain that it’s no longer needed. Encourage all your friends and family to take part in your efforts to civilize your dog. If your dog ignores any of them, step in to reinforce their directions. Your dog must learn to respect everyone. Name: Help your dog create a positive association to his name. Call out your dog’s name whenever you come home or to highlight a positive moment, such as when you’re offering a treat, loving pats, or playtime with a favorite toy. Don’t call your dog for unpleasant activities, such as isolation or unwanted grooming. If you do, he just might hear “Come” and think run! If “Come” has a reverse effect, stop using it. Use a treat cup and also check out the other training techniques in Happy Training, Happy Tails. Of course, you could just keep your dog on leash. Call your dog as you’re walking away from him or when you’re hidden from sight to peak his interest. Shake a cup of treats while saying his name to encourage his enthusiasm for listening and following you. Though initially he’ll respond for the food, you’ll eventually condition a positive cooperative habit. Ultimately, you can phase out food treats and replace them with praise and petting. Sit, please: A dog who sits politely is, in essence, saying please. Teach your dog to sit by either enticing him with a treat held near his nose and moved back over his head or by placing pressure on his waist muscles with your thumb and forefinger as you put gentle upward pressure under his chin. Teach your dog that he must sit before rewards, food, or attention. Follow me: This direction simply reminds your dog that you’re the leader and will make all the directional decisions for both of you. More than a dominance gesture, your leadership efforts convey your willingness to be his guardian and protector. If your dog’s taken this role, use a leash and a proper training collar to manage him (see Helping Your Dog Learn from Everyday Living). Also consider using treats, a treat cup, or a clicker to inspire his cooperation (see Helping Your Dog Learn from Everyday Living). Settle down: This direction encourages your dog to relax. As often as possible, direct your dog to a mat or comfortable rug/bed and provide him with a displacement activity, such as a bone or toy, which will distract him and keep him from idly wandering about. You can use it both in your home or when traveling about. Whether your dog is restless at your dinner hour or quiet time, or you’re waiting your turn at the veterinarian, this familiar direction will give your dog a sense of calm. Figure 4-1: Basic directions can help you organize your day. 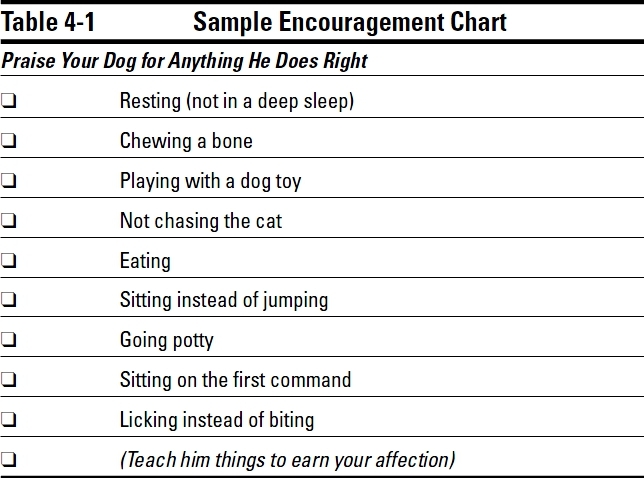 Encourage your dog to sit before giving him anything pleasant. Always lead your dog through the door. He should not leave the home “den” without your accompaniment. Teach your dog to follow your lead. Your dog is programmed to accept you and your family as if they were other dogs. He depends on the social structure you create to make him feel connected and safe. If you communicate direction to him and provide for his needs with consistency, he will look to you to interpret other situations as well. If your dog is unclear as to what you want or you get frustrated with him often, he may perceive you as a moody adolescent dog instead of a leader. Even worse, your dog may decide that you’re an unreliable or incompetent leader, which is bound to make him insecure and frustrate him. When this happens, later behavior problems are virtually guaranteed. Was that out of spite? Do you think your dog behaves poorly out of spite? Think again. Although the authors agree that dogs repeat behavior that get them attention (good or bad) and often act out of anxiety when left alone, dogs don’t react out of spite. Dogs aren’t dishonest or mean. The conclusion that your dog is vengeful will do nothing for your relationship — such thoughts only result in bad energy in the home. Ask not what your dog is doing wrong, but what you may not be doing right. Practice the exercises in the following sections to reestablish your social status. Your home is nothing more then a big den to your dog. How you establish routines indoors affects your relationship more than any activities or training programs you’re involved in. Think of providing your dog with a play station like offering a guest in your home a chair. Your dog doesn’t know where to go in your house until you tell him; when you do, he’ll feel welcome, calm, and included. If you don’t, he’ll likely misbehave, which provokes your negative attention. Because your negative reaction can be interpreted as a controlled or restrained confrontation, your dog may think his freedom is an invitation to play! Decide the rooms your dog will be welcome in. If you have to isolate him now but want him to share, say, the whole house or the downstairs area, take strides immediately toward this goal. Go into each room and select a spot on the floor (or a section of a chair/sofa) for your dog to call his own. For our purposes, we call this area a play station. Identify that location with a rug, a flat mat, or bedding, and place a few of your dog’s favorite bones or toys on it. Introduce your dog to his special area. Bring him into the room on a leash if he’s too fidgety and say “Settle down” (see the earlier “Giving direction” section) as you lead him to his play station. Sit with him and encourage him to focus on his things. Give him lots of attention and feed him treats. Bring your dog with you to these places often. If he won’t stay at his play station, make sure that he’s had a good romp and time to potty and then hold him still with a leash or secure a leash to something immovable. From your dog’s perspective, your main door is the mouth of his den. Whoever orchestrates comings and goings runs the show. If your dog barges through or reacts inappropriately when visitors arrive, he’ll assume he’s in charge. Teach your dog to follow you in and out of the door. Teach your dog a proper greeting ritual, remembering that good manners start at home. Ignore your dog if he behaves in an overexcited or inappropriate manner when you or other family members arrive. (For more tips on responding to jumping or nipping, see Addressing and Solving Problem Behavior.) If he’s been confined alone in a crate, pen, or room, don’t speak to him until he’s calmed down or is chewing on a toy. 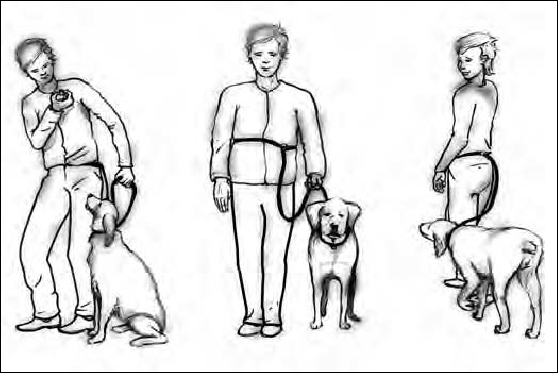 After he’s calmed down considerably, brace him as you greet him (see Figure 4-2), with your thumb clipped over the underside of his collar to prevent him from jumping up. 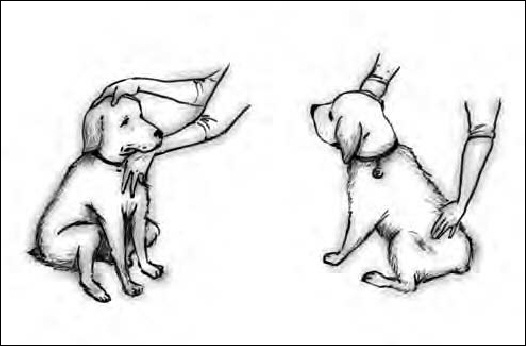 Figure 4-2: Bracing a dog during greetings. To create a greeting station, choose a location 6–15 feet from the door. This location is the place where you’ll send your dog before opening the door when company arrives. Teach your dog the term “Go back” ahead of time, leading him to the area and telling him to “Wait” while you open and shut the door. If your dog doesn’t stay put when no one is present, he won’t sit still when they are. In this case, affix a leash on an immovable object. When you send him back from the door, secure him on the leash. Practice doing this when no one is there, then with your family, and each time someone calls. (If your dog is distractingly rowdy, aggressive, or fearful, please refer to Part IV.) Release your dog after you’ve welcomed the visitor and only when he’s calmed down. The goal is that your dog mirror and mimic your response to newcomers. Your dog isn’t the leader, you are. You can shape his responses by establishing your authority in this way. Identifiable words add a punch of excitement to your dog’s day, similar to being in a foreign country and finding an individual who speaks your language. Good manners flow from calm, consistent directions. Follow through. If you give a direction, reinforce it. Praise your dog for cooperating or position him if he ignores you. Give directions once. If you repeat yourself, your dog will catch on and will not respond immediately. Keep your expectations in check. Just because your dog behaves well with you doesn’t mean he’ll mind his manners when the doorbell rings or you visit family. Keep a leash on your dog if necessary and/or reinforce all your directions immediately.